Starting off on our journey through the Bargue course, we encounter a number of plates that deal with specific anatomical features drawn in a simplified manner. 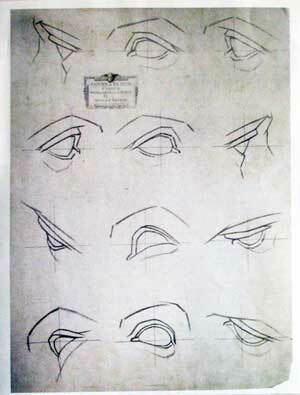 Plate 1 deals with eyes – an appropriate place to start, since we’re concentrating on learning how to “see” as artists. The plates in the book are reproduced smaller than the originals, which are about 18″ x 24″, so I first scanned the plate, placed the image in an 18 x 24″ document, and printed it out full-size in sections on smaller sheets of paper. I want to deal with each drawing one at a time, so I cut out the first one and taped it onto my drawing board. The method I’m using to draw the plates (and the method recommended in the text) is the sight-size method, where the drawing surface is placed directly beside the object to be drawn. The artist observes the original from a distance of a few paces back, using a plumb-line with a weight attached to the bottom, and measures distances visually, either with his plumb-line or some other measuring device, such as a pencil or skewer. 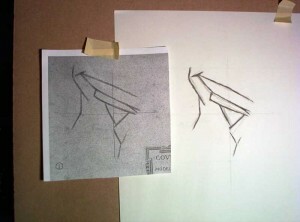 The artist then steps forward and makes a mark on the paper when a correct measurement has been made. He continues comparing measurements to each other until the drawing is constructed in the exact same proportions as the original. Confused yet? That’s what I thought… Ok – now that I’ve written that extremely short and cryptic explanation of the sight-size method, why not check out the more detailed explanation at www.sight-size.com. Darren Rousar has written an extremely helpful book that guides you through the process step-by-step. I own a copy and highly recommend it! 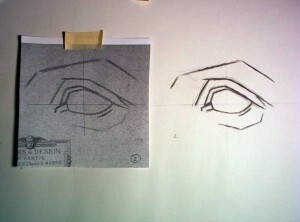 When I began this drawing, it was the first time that I had ever used the sight-size method. Let me say – it takes some practice to get the hang of it… There are an awful lot of smudges and eraser marks on the final piece, but I have to admit – the method helped me to create a very accurate copy of the drawing. When I was finished I compared a tracing of the original to my drawing and was pleasantly surprised to see how close it was! I ran into a little trouble on the bridge of the nose, but everything else matched up pretty well. Overall, it took me about 2-3 hours for this one drawing. That seems kind of long for such a simple piece, but I had the sight-size learning curve going against me.I also had to re-draw my lines a few times as I would discover mistakes upon comparing different measurements. It ended up being better – still not perfect, mind you – but better than before. After a heavy sigh, I decided that it was best to keep moving rather than kill all of my enthusiasm at the very start of what will be a very long project. So, for now it’s on to the next one… I’ll post again when I’ve made some progress.